Each month I’ve been popping in with some quick life hacks and tips to help you keep your home and your day-to-day a little more organized. 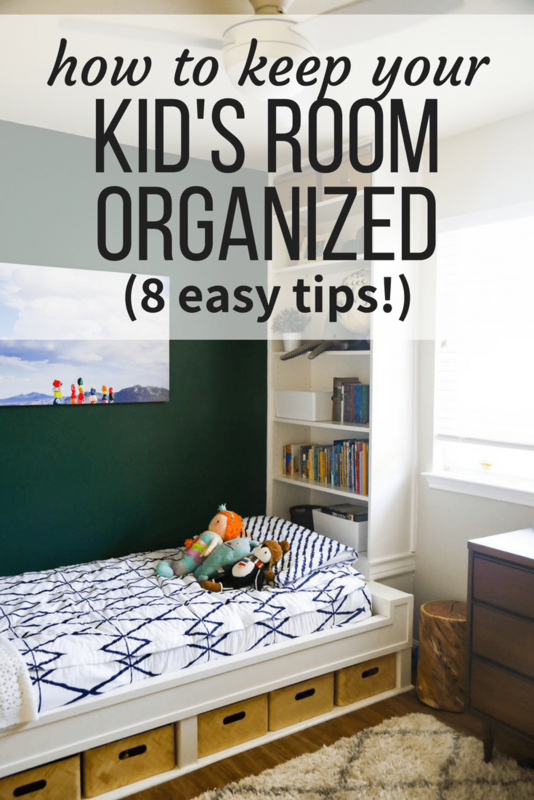 Today we’re chatting all about kids’ room organization and how to keep your kid’s room clean! 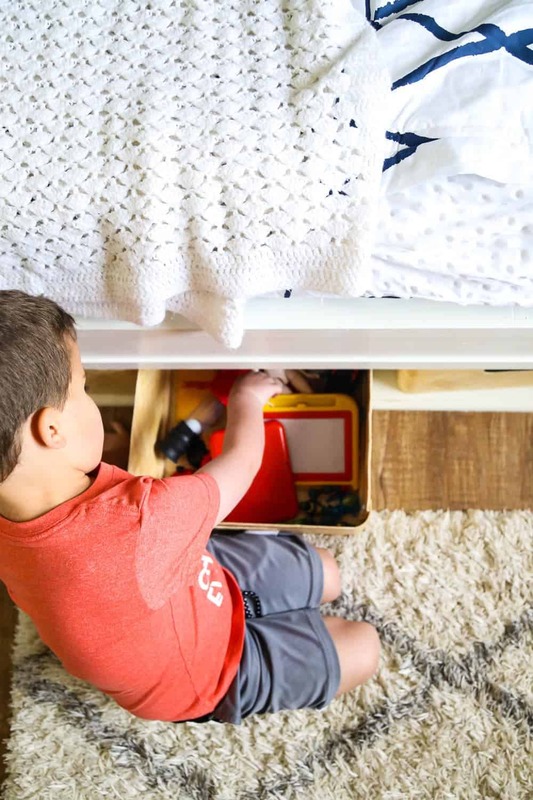 If you follow me on Instagram, you’ve probably heard me complain once or twice (or a zillion times) over the last few months about the organization – or lack thereof – in my son’s room. We really struggled to find the sweet spot between a cute and cozy kid’s room and a hyper-organized space to keep the toys out of my face. I’m not a fan of toys floating all over my house (especially since I barely have room for all of my other junk as it is), so it was high on my priority list to find a way that we could keep all of Jackson’s toys in his room. Also, I’d ideally like his room to be clean most of the time. I have to go in there each night to put him to bed, and I don’t wanna be tripping over toys all the time. It’s not too much to ask, right?! 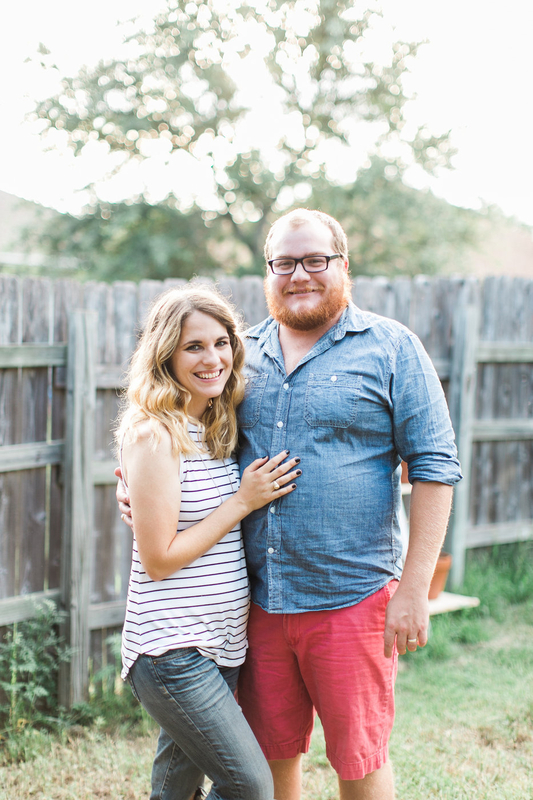 I’ve been working really hard over the last few months to figure out what will work best for us and how to get to a point where his room stays organized and clean the majority of the time. We seem to have landed on a really workable system for us, so I wanted to share what we’re doing to make sure that Jackson’s room is (mostly) clean each and every day! Buy all the baskets. I could probably just drop this one tip here and walk away and be done. Baskets will change your life. You cannot have too many in a child’s room. It is just not possible. I’ve found that it works best for us to have a basket for each category of toys (legos, trains, cars, you get the idea) and stick to it. I had to supervise clean-up time for the first few days after implementing the new basket system, but Jackson got the hang of it pretty quickly. I find that he actually really loves knowing where everything is in his room, and he wants to maintain the system. Designate a place for everything. Nothing is too small to have a designated space. This is good advice for life in general, but it’s particularly vital when it comes to your kiddo’s room. When it comes to toys that you just aren’t sure what to do with, I find that it works best for us to have what we call the “Random Basket”. This is perfect for those toys that we don’t have enough of to need their own basket, but they don’t quite fit into any other category. Make sure this basket is on the small side, or else you run the risk of it becoming a catch-all for junk! Utilize deep shelving. I recently installed some extra-deep shelving in Jackson’s closet to help us keep things organized, and it’s been pretty life-changing. Kids often have a few awkwardly large toys that are hard to find a good spot for – ours are Imaginext hideouts. Jackson loves them and it’s just about impossible to find a good spot to store them. Our deep shelves are exactly big enough to store them all – and I can just close the closet door so we don’t have to look at them all the time. Make it personal. Kids are way more invested in keeping a space clean and organized when they really care about it. We’ve worked to allow Jackson to have things in his room that mean a lot to him – for example, he has an area to display his favorite art projects and he keeps his rock collection on his windowsill. It actually helps me keep things cleaner and more organized (the art isn’t all over my house, and I don’t have to deal with storing a rock collection elsewhere), and it makes him more motivated to keep the room clean! Make it easy on them. I can’t emphasize this enough – the easier it is for your child to keep their room clean, the more likely it is to stay that way. That’s why I love baskets – kids can just toss toys in there without any extra effort. We recently had the opportunity to try out Beddy’s for his bed as well – it basically functions like a sleeping bag for his bed and makes it a breeze for him to make his bed every day. Before, his blankets were always just in a pile on the bed and neither one of us wanted to deal with making it – beds against the wall aren’t fun! Now? All he has to do is zip it up and he’s done. It’s totally worth the investment and makes his room feel way cleaner on a day to day basis. Get creative with adding storage. Probably the biggest game-changer for us in Jackson’s room was adding his built-in bed and shelving. There was no storage at all in here before, and now we almost have more than we know what to do with! This will last him forever, it looks great, and it’s a great system for keeping the room clean. Win-win-win! Let them have input. This goes along with making things feel personal for them, but I think it deserves its own bullet – it’s vital that kids have input in the design of their room if you want them to feel invested in keeping it clean. I made most of the major decisions in his room (like the design of the built-in bed, the color scheme, etc.) but any time I have a chance to let Jackson give his opinion, I do. Generally, I’ll narrow the choices down to a few things (all of which I’d be okay with) and then ask his opinion. This is the route we took for the canvas that hangs above his bed! I also sometimes just let him have free reign – for the bedsheets that he had before we got our Beddy’s, I let him choose whatever he wants. They’re covered up most of the time, so it doesn’t make a difference to me what they look like. Make cleaning a habit. Jackson has to clean his room every single day. Every. Single. Day. It’s just a part of our routine, so it never gets out of control. There are two different opportunities for him to get his room clean each day – first, in the mornings when we do our morning chores (read more about that here), and second in the afternoon when he finishes his rest time (he usually plays in his room for rest time, and he has to clean up before he can come out). It was not a fast or easy process to get to a point where Jackson can independently keep his room clean, but it was absolutely worth the effort! I can’t promise this will be a completely fool-proof method for keeping your kids’ rooms clean. I also can’t promise you that it’ll last forever without needing to be tweaked. But I can promise you that this strategy has worked for our four-year-old for several months now and I don’t see that changing anytime soon. It does require you to stay on top of things (reminding them to clean their room daily, sticking to the rules about putting things where they belong, actually checking their room each day), but if having a clean home is important to you then it’s definitely worth it! 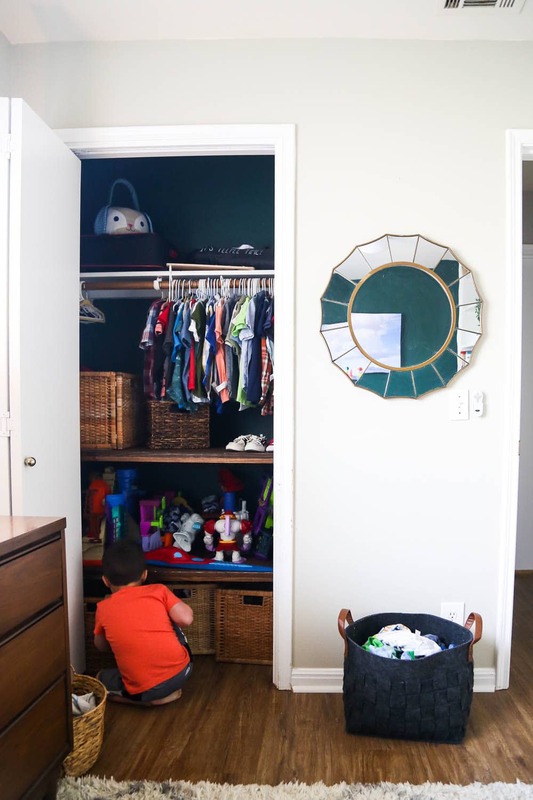 Now that Jackson has a very specific spot for every single thing in his room – and he knows exactly where that spot is – it’s so easy for him to keep his room clean and I can tell that he actually really enjoys having a cleaner and more organized room. Miss a Life Hacks Post? Catch up Here! What are your best tips for helping your kiddo keep their room clean?